We first got really excited about Gogoro a little over six months ago when we met with some of the team at the EICMA motorcycle show in Milan. They showed us the Smartscooter, a clever little electric scooter that had swappable batteries and has gone down a storm in Taiwan (read about it here: Gogoro Smartscooter). Now they have announced the Smartscooter 2, which should be more fun to ride and, so Gogoro say, almost impossible to steal. The Smartscooter has the same performance stats as the original model, so its 6.4Kw G2 motor powers the scoot up to a top speed of 55mph with a 0-30mph time of 4.3 seconds. The range is roughly 68 miles, but unlike other electric vehicles you can swap the batteries at battery docks. In Taiwan, where Gogoro are based, there are roughly 500 battery docks at various public locations and petrol stations. There have been some hardware changes though, the biggest of which is a swap to a two person seat. Not only does this increase the person capacity, it has also increased the luggage capacity as the scooter will now take two helmets in the space under the seat. The other big change is a switch to a 14” front wheel with a 13” back wheel, which Gogoro say improves handling and increases the stability of the scooter around town. On top of hardware changes, there are software changes too including the addition of an extra security measure to start the bike. As well as the usual ignition key, the bike also makes use of fingerprint scanning in your mobile phone to ensure that even if someone steals the key or forces the lock, they can’t get it started. And how much for all this forward looking tech? Rather amazingly it will go on sale later this year in Taiwan for around £1,000, which is nearly half the price of the original. 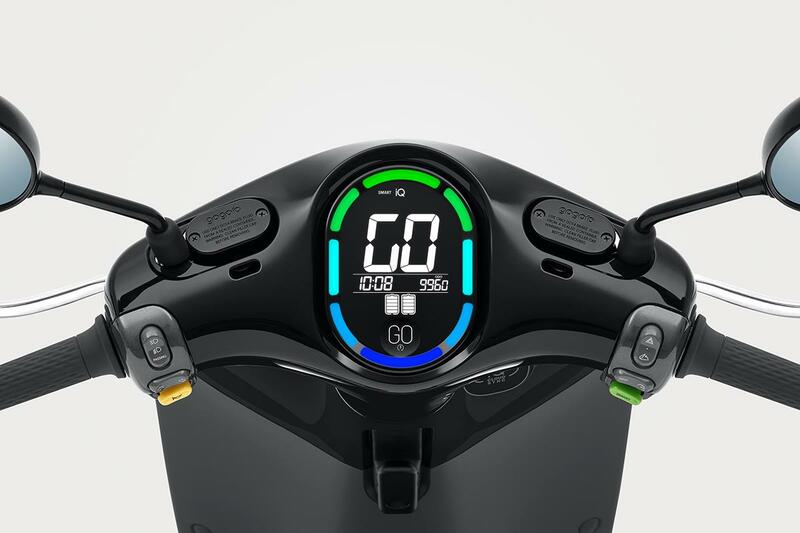 As for seeing one in the UK – Gogoro have spread into Europe with a sharing scheme in Germany and another soon to follow in France. With the right infrastructure, we could see this coming to London within two years before spreading out through the other major cities.